ShotPut Pro is a useful piece of software that can automate the process of transferring HD media files onto your PC. The application supports numerous image and video formats, but also devices such as Alexa, Compact Flash, RED, SDHC cards, Panasonic P2 and others. If the connected storage device is used just for multimedia you can set ShotPut Pro to automatically detect and offload data to a user-defined folder. 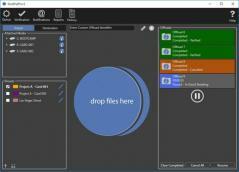 It’s also possible to perform manual offload which is simplified thanks to drag and drop support. On top of that, you can create presets which you can use when starting the offload. These presets lets you define output settings such as the destination path and output file naming. It’s also worth mentioning you can use ShotPut Pro to verify the integrity of your files using various methods such as MD5, CRC Checksum, and SHA.